Isaiah went to western Kansas with Amy this past weekend to visit Rex's family. It was really a big deal. He didn't want to eat until Amy told him that she was going to call me. He said he missed me and he loved me. LOL, maybe he thought he wouldn't have to eat if he said that. Because of the bad weather we got yesterday, Isaiah's bus was running late today. In fact, they were so late that we weren't sure they were coming. Ron said, "Are you even sure the buses are running today because of the snow and ice?" Isaiah: "Grandpa, buses can't run. They don't have any feet. They only have wheels." And then he grinned. He's got such a sense of humor! I think I may have mentioned before that an open water bottle becomes Isaiah's water bottle. He just knows you want to share with him. I walked into the bedroom tonight and noticed my water bottle open on the nightstand. I immediately knew who did it (and he was in the bathtub), so I went into the bathroom and said my water was opened and he had done it. He looked at me with wide eyes, thinking he was in trouble. Instead, he gave me a cheesy, toothy grin. Gotcha! Isaiah played in his room - by himself - for over two hours. This is really big. Isaiah's room is in the basement and he's usually afraid to be there by himself. He decided to stay downstairs after the jewelry party and finish watching a movie. I went down a couple of times to check on him and he was quietly playing each time. He wasn't ready to come upstairs until about 9:00 tonight. He even turned out the lights as he came up. I had a jewelry party today and a couple of my friends from work came. One has two little children - a boy and a girl - and both are younger than Isaiah. The oldest one (a girl) will be five in January (Isaiah will be six in April) and the youngest (a boy) will be three in March. Isaiah and Renee have been to each other's birthday parties ever since he came to live with us. Garrett has come, too but mostly as the baby bystander. Now, he's old enough to actually play with the "big" kids and enjoy the toys. Isaiah has a bouncy ball - you know, one of those things with a handle that they sit on and bounce up and down on. He got it from my ex-husband last year for his birthday and it's become one of his favorite toys. He had a lot of trouble sharing that so he ended up deciding that neither of them would play with it. He's also got Smart Cycle that Garrett really loved. We didn't have it hooked up but Garrett and Renee both got on and pedaled. Isaiah was not too pleased but I was really proud of him for not being too vocal about it. He did say, "He's swiping my toy." I got a good laugh out of it and told him that he was not. 1. It wouldn't fit in Garrett's back pocket. 2. His mom wouldn't let him if it did. 3. You have to share it. I said there is no #4. He said OK and went about his business. Green means you've had a very good day. Isaiah has had two in a row, and one was with a substitute teacher. That is very good news! She even wrote a note for Amy and said Isaiah was "fantastic" for the sub. The world through Isaiah's eyes is a wonderful place. When he sees the alphabet and names the letters, he almost always says, "And there's my 'I'" when he gets to that spot. It's become "Isaiah's I" to us now. Isaiah was diagnosed with PDD-NOS, which is part of the autism spectrum. He may end up with an Asperger's diagnosis later but he is too young for that diagnosis now. He's a lot more sociable than a lot of children with an autistic-spectrum diagnosis. Isaiah is very immature for his age, but he's also very charming. He has a great personality and once we got past his "I have to do it this way" routines, he's mostly very easy to deal with. There are times when he does challenge our patience and other times where he is the most charming child you would ever want to meet. I am so blessed to have been able to be in his life as much as I have been. I would not have wanted any of the last three years to have not taken place if it meant that I would have lost this wonderful opportunity with Isaiah. Things he's done in the past include lining things up by size, color, or shape; insisting there was only one way to do something because he could not fathom any other path to the same result; not understood when people were laughing that they weren't laughing at "him" but rather at something that he did; having his own special language that only he understood - a language that he was so good at that he could repeat the same sounds exactly if you asked him to repeat something; not eating food because of the texture, or changing a like to a dislike overnight because of texture; had uncontrollable, inconsolable emotional meltdowns over very minor incidents; flapping his arms when he's excited (he still does this but says he's flying). I'm sure there are many other things that I've left out but I can't remember them right now. Many children with an autism-spectrum diagnosis are very sensitive to touch, and Isaiah has been no different. He does not like to be touched by strangers (even unfamiliar family members) but will readily give hugs and affection to people he knows and has gotten comfortable with. He is very picky about how high we can fasten his coat or zipper, he doesn't like things around his neck, he doesn't like his clothes too tight, and he doesn't like the feel of certain materials. He also is very resistant to change, no matter how slight. If we tell him that we're going to do something in 1-2-3 order, and we suddenly reverse 3 and 2 now doing it in 1-3-2 order, he is very adamant that we have to do it the other way. Later he asks her again what her name was and she very sweetly reminded him (many times). He said his grandma (that would be me) was cute. She thinks he's funny. We all got a good laugh. During the course of the evening, he tells us his girlfriends' names (he has six or seven), tells Holly (and her manager, Brittany - who just happens to be Holly's sister) that he's a good singer. He's usually pretty shy so we figured he'd clam up and not sing, but he didn't. I wasn't sure where he got the "cute" phrase from until I heard him say (in Rudolph-fashion), "I'm cute! I'm cute! She said I'm cute!" I thought I was hearing the movie. Isaiah likes to play Mario Kart but he calls it "a game called racing" and he asks if he can play "a game called racing" - every time he mentions it. He wants to play the "dark one" and the "mushrooms" all the times (all the "times" means each time he plays it, not just one time). Bryan doesn't know how to play a game called racing, so Isaiah says he'll teach him. Isaiah beats him. Badly. Several times. Finally, Bryan was able to beat Isaiah in one race. Isaiah looked at him and said, "you can play by yourself." It doesn't sound too comical to see it in print, but if you could hear Isaiah say it you'd know that he was none too happy that Bryan got good enough to beat him. Have you ever gotten onto a child and, in order to deflect the punishment, you suddenly hear "I need a hug" come out of his/her mouth? Isaiah is a prime example of suddenly needing a hug or a kiss. To be fair, he often wants a hug or a kiss anyway. He's a very affectionate child and I thoroughly enjoy his statements that he needs a hug. He probably knows that I need one, too. Isaiah sometimes has difficulty in school. Because of his developmental delays he's not as savvy as some of the other children. He's also not as mature as a lot of the children in his class. I was looking at the statistics on his classmates and Isaiah is among the youngest and the smallest of his class. There are even several girls who are bigger than he is. Many times Isaiah will say something happened to him "yesterday" when, in fact, yesterday means any time in the past. If he says something is "tomorrow" he means any time in the future. When other children pick on him they often get by with it because they are more subtle and don't get caught. Isaiah remembers that they've done something to him and he does try to get even with them. He nearly always gets caught and then he gets into trouble. That's how it should be. We don't want him to get away with things and when he gets into trouble at school, he has consequences at home. Isaiah has had a problem keeping his hands to himself. One day, he came home with a note that said he'd hit a girl. I got on to him and explained that he's to not hit ANYONE at any time, but especially he's to NEVER hit a girl. If someone else hits him, then he's to tell the teacher, but not hit back. He said he understood and he wouldn't do it again. The next day he came home and said he got into trouble for pushing someone. But, he said he didn't hit a girl. As if that made it all OK. I think he forgot the first part of that - don't hit ANYONE. Wouldn't that phrase just melt you? Isaiah told Amy that the other day and then he said, "And I make your heart happy." Yes, Isaiah - you make our hearts very, very happy! And an alligator named Toad. Isaiah has a vivid imagination. His teacher said that they look forward to his letter of the week show and tell. They never know what he's going to pull out of the bag. Have you ever met an alligator named Toad, or a snake named Tortilla? I hadn't either. Isaiah told me today that Tortilla is a very good name. I agree, but I usually eat things named "Tortilla." I just can't tell Isaiah that. Isaiah also has a stuffed dog named Shrek. Amy got home from her class last night and was trying to tell me something. Each time she said it, she was either walking away, or the TV was on and I couldn't hear her. She came back into the room and told mewhat she wanted to say. Isaiah was in the tub in the next room so she was talking really quiet. Amy: (very quietly) It's a dinosaur that walks with a remote control. It's really big. Isaiah: A dinosaur! I love dinosaurs that walk! Amy: (laughing) Is there a book about walking dinosaurs? Isaiah: Yes, I want that book. I was typing up something and Isaiah saw the letters of his name. He said I was writing "Isaiah loves pumpkin pie and you fix it like this." Bake it brown before you cook it. Cook really hard. The oven has to be on 20. It has to cook really fast. It takes 100 minutes. Then you can eat it. Isaiah had a great time with his friends on Halloween. He dressed up as Woody from the Buzz Lightyear movie. Amy bought him a "horse" to ride. He looked so cute. I saw this haunted house on Cropmom's site and knew it would be perfect for use as a frame for some of his pictures. I decided I wanted to try my hand at digital scrapbooking. I didn't want to spend a bunch of money doing so, especially since I wasn't sure if I would like it or if it was something that I could see myself doing instead of paper scrapbooking. I asked some friends and found out that one place, http://www.scrapbookmax.com/, has a 30-day free trial. I haven't downloaded it yet. 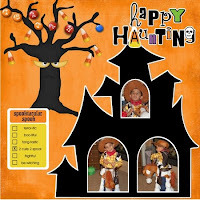 I did some searching and found http://www.bellascrapbook.com/ and while that site has some nice templates, the cost of purchasing the ready-made layout was too much for my budget. Another place, http://www.cropmom.com/, has free layouts but then you have to purchase them if you want to print them. If you take the lower-resolution ones, they also come with a cropmom watermark on them. They're OK for emailing and for putting on a Web site, but nothing else. 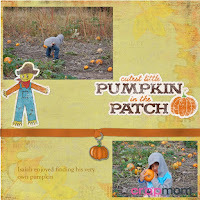 I made the following layouts (using cropmom) from Isaiah's visit to Walter's Pumpkin Patch. 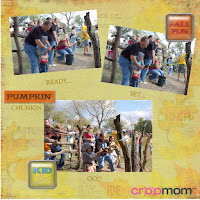 Isaiah had a great time at the pumpkin patch with his mom and Rex. They did so much that he was absolutely exhausted and fell asleep in the car on the way home. He slid down the underground slide, climbed the rope ladder, picked some pumpkins and gourds, rode the sawhorse "horse" (with Rex holding on), rode in the paddle boats, did the "punkin chunkin" slingshots, and I don't know what else. He was one filthy, tired boy. Amy brought Ron and I back some pumpkin bread, zucchini bread, and pumpkin butter. It was very yummy! We now have quite the assortment of pumpkins and gourds on our front step but they look very nice. It really adds a nice "fall" touch to the outside of the house. I have a Bluetooth system in my car so when I want to call someone I just have to push a button located beneath my rearview mirror. The computer doesn’t always recognize what I’m saying so it is sometimes very frustrating. I can say “Ron” and it thinks I’ve said “Kris” instead – which is no where near Ron. Saturday afternoon I was driving home with Isaiah in the car and I wanted to call Amy. I pushed the Bluetooth button and Isaiah immediately said, “Who would you like to call? Kris? Calling Kris. Is that correct?” He had the same tone as the computer and actually very nearly got what the computer says correct. It was absolutely hysterical. Isaiah wants a dad. He doesn't really remember Juan but he knows that other kids have a dad (his mommy has one, too) and that he doesn't. Sometimes when he gets into trouble he cries, "Daddy. I want Daddy." We think that he's using that for two reasons - 1. he really does want "daddy" or 2. he's trying to deflect why he's getting into trouble away from himself. It could actually be a combination of them both. Isaiah also loves to pretend that we (him, Amy, Ron, and I) are the Backyardigans. Isaiah is Pablo, Amy is Uniqua, Ron is Tyrone, and I'm Tasha. Juan is Austin but Austin isn't in too many of the Backyardigan shows so that's appropriate (him not being around much). The other day Isaiah was in trouble. Lots of trouble. Over and over again kind of trouble. He just couldn't seem to settle down and do what he was told. I put him in time-out and he started to cry for Juan again. I picked him up and again explained that we could not get his dad and that his dad had no way to know that Isaiah was upset. He was quiet for a few seconds and then he said, "I want Austin." The child is no dummy... He knew that I said to not ask for Juan again and he side-stepped that by asking for Austin instead. Smart boy. We're praying for a Godly man to come into Amy's life and be the dad that Isaiah needs - the one that Juan should have been and isn't. We pray that he'll love Isaiah like he's his own and never for a minute let him think anything differently. That's the kind of man God gave my children and that's the kind of man I pray that God will do for my grandson. Of course, I want him to love my Amy just as much as Ron loves me. Amy had been told that he wasn't eligible for the bus because we live too close to the school so he was not ready yesterday morning at 7:30. She told the bus driver that she didn't think he was a rider so the driver said she'd check. Amy decided that she'd have him ready at 7:30 this morning just in case. The bus came at 7:22. LOL - the driver told Amy that Isaiah was indeed eligible to ride the bus and that she'll be here to pick him up at 7:22. School starts at 8:00 and we're less than 3 miles away so not sure why he will get on the bus so early. Oh well... Saves Amy (and me) having to take him. He was very disappointed that he didn't get to ride the bus to school. He's very excited to ride the bus to latch key in the afternoon though. Every day that Isaiah comes home from daycare I ask him how his day was. He usually tells me he has one - or maybe two - popsicle sticks. They start the day with five and then can earn up to three more. Some days he has more and even though he's lost a few, what he has left shows that he's also earned some. I raised a child with these same issues and I taught two children (when I taught kindergarten) who had the same issues. It's very easy - VERY easy - to focus on the negative things the child does because they get you to a position where your nerves are constantly on edge. You have to look for the positive things to focus on and to praise the child for doing or they develop an attitude of "I get into trouble for everything I do so why bother to try?" I saw it in Shaun and I saw it in the two kindergarten boys. I inherited the class mid-year when their teacher quit. The class was very small, only two boys and three girls. One girl left so that made the class consist of only four students. They were all very competitive and three of the four were quite intelligent. The fourth child was really too young to be in the class and she struggled with even the simplest tasks. The two boys were constantly doing things that could - and frequently would - get them into trouble. I ended up devising a plan where they all started with several pennies at the beginning of the week. Each day they earned pennies for different things and lost pennies for other things. At the end of the week they were able to go shopping for little trinkets. I spent way more on the trinkets than I charged them (and they were playing with my money) but they had a great time doing it. I never had them lose every last penny because I wanted them to be able to take something home each week showing an accomplishment. I didn't always handle them in the most effective manner but I know that I did try very hard to teach them to focus on positive behaviors. One child absolutely could not and would not sit still. He frequently fell out of his chair and usually said, "I'm ok." It was very hard to keep a straight face on some of those times. LOL, when the year was over I knew that my calling in life was NOT teaching kindergarten students. When I went to pick up Isaiah today I asked him how many sticks he had and he told me that he had one. I told him that was good – he still had a popsicle stick. His teacher gave me a strange look that I interpreted to mean “why” was I praising him for having only ONE stick out of FIVE. Obviously she didn’t get the message that dealing with Isaiah they need to focus more on his positive behavior and not the negative. Granted, Isaiah has issues. And Isaiah can be difficult. But, Isaiah is a really sweet boy and doesn’t do things for meanness and then laugh about it. Sometimes he smiles when he’s getting into trouble but it’s usually because he doesn’t want you to be mad at him. Sometimes he does think what he’s just done is cute and is smiling at what he did. Sometimes it’s difficult to tell the two instances apart. You just have to put out some extra effort to do so and that’s something that some people don’t seem to be able to do. Sometimes Isaiah says the kids were picking on him and his teachers don’t believe him. Sometimes it may have been hours earlier and he doesn’t realize that he can’t retaliate (then or at any other time) but that he should have told the teachers. Isaiah has no concept of time. Everything that happened in the past was “yesterday” and everything that will happen in the future is either “tomorrow” or “next week.” His teachers don’t get that connection which makes them not believe what Isaiah is saying and tell him he’s just telling stories – or nicely implying that he is lying to them. Isaiah doesn’t think he’s telling a lie. He’s also not as subtle as other kids. This morning when Amy took him to school, all of the little boys in his class had to poke at him. He told Amy that they were picking on him but none of his teachers saw it. I told Amy that she needed to call the director and let her know that these kids were antagonizing Isaiah in her presence, so what was to stop them from doing it at other times when the teachers are not looking? Isaiah is an easy target (which is also another trait in children like him; Shaun had the same issues when he was growing up). Thank God that Isaiah is still naïve enough to not know that he’s being singled out. I also see it in other areas that involve socialization. Isaiah invites most of the children (in his age group) from church to his birthday parties. I don’t think a return invitation has been extended to him by more than two of the other parents. I'm so thankful that school is starting soon. Isaiah has been going to our church daycare since January 2006 and has really thrived. A lot of credit for his early advances goes directly to the ladies who worked with him when he first arrived. He started the early education program through the school system in the fall of 2006 and went through the 2006-07 school year and 2007-08 school year. He REALLY thrived with all of that. Although he's got some behavior issues, he's really a good kid. He picks up on negative actions and imitates them. He picks up on positive actions and imitates them also. It's normal childhood development. The staff and administration of the daycare has changed in the last year and they have really cracked down on what they perceive as obstinate behavior in Isaiah. Some of what he does he's aware that he should not be doing. Some of what he does he does not realize that he should not be doing it. Although he is five, he is really not as mature as most five year olds. I would classify his maturity level closer to 3-4 years old. Plus, with PDD-NOS, he doesn't really pay attention to group instructions, such as "Everyone line up to go potty." The early ed teachers realized that they have to get his attention and say to him directly to line up, or he often doesn't realize that he's being talked to. The teachers at daycare have written him up for every little infraction, no matter how insignificant. "Isaiah was told three times to quit shaking his toothbrush in the cup. He finally had to have it taken away from him." "Isaiah was told twice to quit singing in the line." "Isaiah threw himself down on the floor while his mother was still there." For each infraction, he had to give up a Popsicle stick. Popsicle sticks are behavior rewards and if he loses all of them during the day, he does not get any TV that night at home. If he has at least one left, he can watch Noggin. If he has at least two, he can pick a movie to watch. So, his behavior at school dictates what kind of privileges he gets at home that night. Sometimes we really hate to punish him for what we consider to be insignificant things, but we do in order to be consistent and to impress on him that we support what he's been told. We make sure we praise him for doing good things, even if it's stopping a negative behavior when we ask him to. There are times when it's difficult to cope with his behavior but I just try to realize that fit throwing and whining are normal behaviors for a lot of kids in the 3-4 year old age range and that's where a lot of his emotions are right now. But, he's really a wonderful child, very smart, and very loving. He just needs some extra patience in a few areas. We told daycare that his psychologist advised trying to find positive things to mention to Isaiah, instead of always focusing on his negative behavior. There are times when I'm sure Amy makes excuses for him when she maybe should not. But she also realizes that he needs some different approaches to instruction and punishment. It's a very fine line between what's normal for his emotional level and what is not. Poor Isaiah! He gets into trouble so much lately that Amy is at her wits end on how to get through to him to behave. He says he's a "bad" boy and when we tell him he is not I'm not sure that he believes us. He's been in trouble quite a bit at daycare for various things, one of which is him wanting his own way. We've run into this at home, too - for which he gets a time out or other appropriate consequence, and last night was a prime example. It was bedtime; we were all tired and ready for bed. Amy got Isaiah's pajamas out and told him to come and she'd help him change. He's always wanting to do one more thing so he told her "just a minute." She let him know that she wasn't doing this on his time frame and if he wanted help with his pajamas he could just come into her room. A 30-minute battle of wills ensued following this and I finally ended up intervening because I wanted to get to sleep. He was so loud and insistent that she HAD to go back into his room that I went downstairs. When I got to the bottom of the stairs and very sternly said his name, he got quiet and hid behind his mom. It's not like I was going to do anything to him but he knew I was meaning business. I wanted him in bed. I did end up going into the bedroom and telling him that he needed to do what mommy said and quit arguing with her. He ended up with me putting his shirt on and putting him in Amy's bed, after which I went back upstairs to my bed. He cried for a few minutes and then it was quiet. Amy came back upstairs, carrying him in her arms and saying, "I know why it matters now. I've figured it out." I was confused as to what she meant but as soon as she explained it, it made perfect sense and makes me wonder if some of his other episodes are because of this very reason, too. Isaiah was out of his pajamas and very sad. Amy told me that she didn't connect what he wanted to do until he told her, "You have to come back to my room so you're not mad." What he REALLY wanted - instead of having his own way - was to erase the episode completely by replaying it from the exact place and the exact time frame where his mom had gotten onto him. He could only see that she got upset with him in his room over the pajamas, so she had to go back to that place so he could "erase" the incident as if it didn't happen. He kept saying "and you won't be mad at me" "you have to be happy with me." Poor thing - his little mind just can't wrap around the fact that we don't carry the anger with us and when he gets into trouble for doing something that we don't have to back up to right before he did it for him to make amends. After realizing that, an earlier incident made perfect sense - and other incidents came crashing back to my memory that also made sense. Earlier in the evening I had been sitting in a dining room chair and Isaiah was standing over my left shoulder. Amy and I had been talking and he wanted to talk but I told him to hush and it would be his turn in a minute. LOL - he collapsed on the floor and I imitated him. He yelled; I yelled. This went on for several minutes before he realized that he needed to quit having a a tissy. I asked him if he was ready to tell me what he wanted and he said he was - but I had to get back in the same chair and he had to stand in the same position. It sounds like he just wants his own way, but it really makes sense that he can't see there's any other way to address the situation. I don't know how much of this is an "autism" characteristic but it is definitely something that Amy should discuss with the counselor she's been referred to. And he didn’t cry or fight it. Now that might not seem like a very big deal to people and some would wonder why he’d fight it or cry anyway. With Isaiah’s condition comes hypersensitivity to sound and to touch. The sound of the clippers and the feeling of them gliding across his head are just about too much for him to bear. It is physically painful for him to experience these sensations. His mom rewarded him with a new puzzle for being so brave. He loves puzzles and does a great job on putting them together. Isaiah got a new book, Puff the Magic Dragon, for being so brave when he got his immunizations on Friday. He needed four of them so you can imagine he was not too happy with all of the needle sticks. I've been trying to teach him the song so he can "read" and sing along in the book. He has picked it up pretty quickly, but he is a bit confused. Me: Puff the Magic Dragon lived by the sea. Now you try it. Isaiah: Puff the Dragic Mountain lived by the sea. Me: Try again... say it slowly. Puff the Magic Dragon. Isaiah: Puff the Dragic Mountain. Me: Say it with me, ok? OK. Here we go... Puff...the...Magic...Dragon...lived...by...the...sea. Isaiah: Puff the Dragon Mountain lived by the sea. Me: Mountains don't live by the sea. The dragon lives by the sea. Isaiah: No, Grandma. Say it slowly. It goes like this: Puff...the...Dragon...Mountain...lived...by...the...sea. And...frolicked...in...the...autumn...mist...in...a...place...called... honeylee. Me: OK, Isaiah. You sing it really well. We'll work on the next verse later. Isaiah loves school. He loves school so much that sometimes when he wants to go, he tries to escape from the house to “take” himself. Because of this we added a higher bolt on the door that he can’t reach – and even with a chair he wouldn’t be able to operate it. We also have chimes on the front door, door to the garage, and both sliding glass doors. The sliders are always kept locked and Isaiah can’t operate the locks. At the top of our deck stairs we have a gate. At the bottom of our deck stairs we have another gate. Isaiah can’t operate either of them. Because he’s been diagnosed with PDD-NOS (a mild form of Autism), we have taken these extra precautions and had the city put “Autistic Child Area” signs up at each end of our street. Isaiah doesn’t look like the poster child for autism. In fact, just looking at him you’d only suspect that he’s a bit small for his age or that he was younger than he is. His communication skills are a bit behind and he’s obviously a bit immature. But, he’s not a danger to himself or anyone else. He just takes a little bit more patience in some areas. One thing we are sure of is that he’s afraid of any more water than what is in his bath at night. In fact, if we put in too much water, he tells us, “That’s enough,” or to take some out. We have a lake outside our back yard and even though he’ll never be outside alone, we’re not worried that he’ll try to go down to the water by himself. He’s not adventurous at all and will only very rarely try new things. He is very set in his ways and has to follow his routine. Exploring the outside on his own is not something that he’ll do.One of our neighbors across the street noticed the signs. We’re not the only family with a small child in our household but for some reason she decided that she needed to come over and ask. I wasn’t home when she came so she got to talk to Amy. She “wondered” if the signs were put up because of Isaiah and was worried about her backyard pool. Now, this sounds fine and dandy and very thoughtful of the lady. That is, until she opened her mouth again and said, “I’d hate for a child to fall in our pool because the gate isn’t always closed. I’d hate to lose our house because someone sued us.” She’s no longer sounding concerned for Isaiah’s safety; she’s sounding worried about losing her house. I wish I'd been writing down the things that Isaiah has said during the past two years. His language skills have really increased since he's been going to the developmental program through the school system. When he came to live with us he spoke very limited words and mostly in his own language. Before Amy got out of the Navy and came back home, Isaiah called me "mom" and would correct anyone who tried to say I was "grandma." Isaiah called her "mommy" and called Ron "grandpa" but we decided that since I was THE mom of the house, then that's what he thought he should call me, too. We had our pictures taken in the summer of 2006 and put them into a frame with the inscription "Isaiah and his two Moms" so it would be something that he'd have later and know that he didn't always call me by grandma. 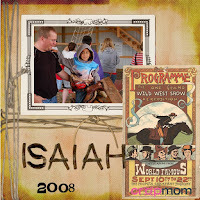 Here are just a few of the things he's said fairly recently: I just can't imagine our household these past two years without Isaiah being there. He's been such a joy and watching him grow and develop has given me countless hours of happiness. I thank God for him and for allowing me to be such an active part of his life. I hope that when he's an adult he'll have fond memories of his time with us. That may seem like a strange title for a blog, but once you read the details you will understand. Isaiah is my grandson and he was diagnosed PDD-NOS about 16 months ago. He came to live with us when he was nearly three and he had a very limited vocabulary. He also did not make much eye contact with others, did not appear to hear when spoken to, and did not like change, textures, or a slew of other things. He was assessed by our school system as being developmentally delayed (failed all of the tests for his age) and was referred to the early education program. He flourished during the two years he was in the program and has started kindergarten this year. He does have a para who works with him for 2-3 hours each day, five days a week. He is mainstreamed but still receives some additional services such as speech.